The procedure itself is complicated and expensive. First and foremost a number of spells are performed to slow the metabolism and chill the blood. Over time the organs are all removed, bar the brain, heart and, of course, the stomach. The blood is filtered out for formaldehyde, while the stomach is filled with gravedirt, to provide an anchor for the soul. When the heart stops beating the transformation is halfway complete. This process itself does not itself confer any magical powers to the subject, but does allow for some bizarre uses of the host body. By the time the subject is far enough through the process to travel they will already possess many of the traits of the undead. From first level, Belmothian necromancers will be immune to healing magic and will have the positive-negative energy reversal effects of true undead. The subject will still have to sleep, and will be susceptible to critical hits, but these weaknesses will fade with time (levels). The stomach, once filled with hallowed earth, becomes a great place to store valuables. The gag reflex is suppressed simply by slitting the throat from the inside, and objects as big as an arm can be readily swallowed. The swallow can be used as an attack on anything much smaller than the Belmoth, around the size of a cat, for a normal person. The stomach does 2d6 damage each turn as it churns. Egress can be made through the bellybutton if a quarter of the Belmoth's health is dealt as damage from the inside. As the stomach distends it allows for yet more creative use. The dirt within the stomach can be used to store animated corpses, ensuring that a host of zombified servants is only a bulimic fit away. Corpses can be ejected one by one, or all at once in a great torrent of rotted flesh. The Belmoth may store 1 humanoid corpse per level, even when this amount of bodies stops making sense. Additionally the necromancer may now swallow creatures only marginally smaller than itself, which, after all the bloating, probably means most people. Swallowed creatures now take 3d6 damage per round as the corpses within the stomach clutch at them greedily. Preservative blood cannot hold away the rot forever. The body bloats with gas, which bleeds out of cuts and abrasions. Anyone hitting the necromancer with a sharp weapon must save vs poison or be stunned for a round, as dizziness blurs their vision and and acrid fumes burn their eyes. This gas is flammable and fires near a Belmoth's wounds will cause minor explosions (2d6 damage to anyone nearby, anybody but the Belmoth can reflex save for half) that burn through the day's production of corpsegas. If the Belmoth doesn't want to be full of gas they can spend twenty minutes each morning poking tiny holes in their abdomen and letting it all out. Though the standard Belmoth procedure calls for formaldehyde and a great deal of pickling salt, a little experimentation doesn't go awry. The subject's blood may be replaced with any fluid they deem worth the effort. A little molten silver will ensure that their attacks always deal maximum damage to werecreatures and fey. Holy water will give them a resistance to demons and the turning of holy clerics. Basilisk venom may grant the power to meld stone, while something as simple as sand can be used to grant damage reduction against bludgeoning weapons and falls. Get creative! NOTE: Please oh god replace your blood with eels and tell me about the horrible side effects. 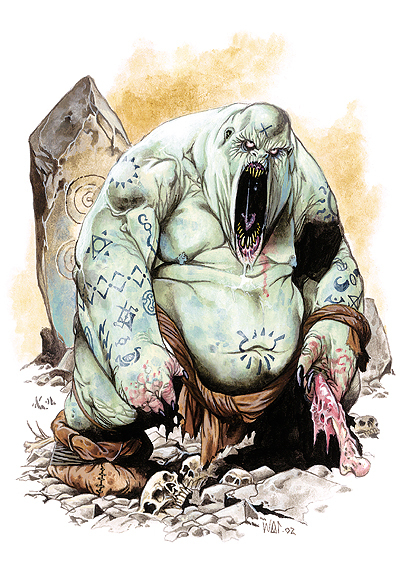 Nobody can really agree whether Belmoth was the name of a necromancer, the town a necromancer was born in or the title of the demon a necromancer stole their powers from. Regardless, a whole suite of dark magi now seek lichdom through the spooky arts of Belmoth. The Belmoth procedure is a great deal slower than most forms of obtained immortality. 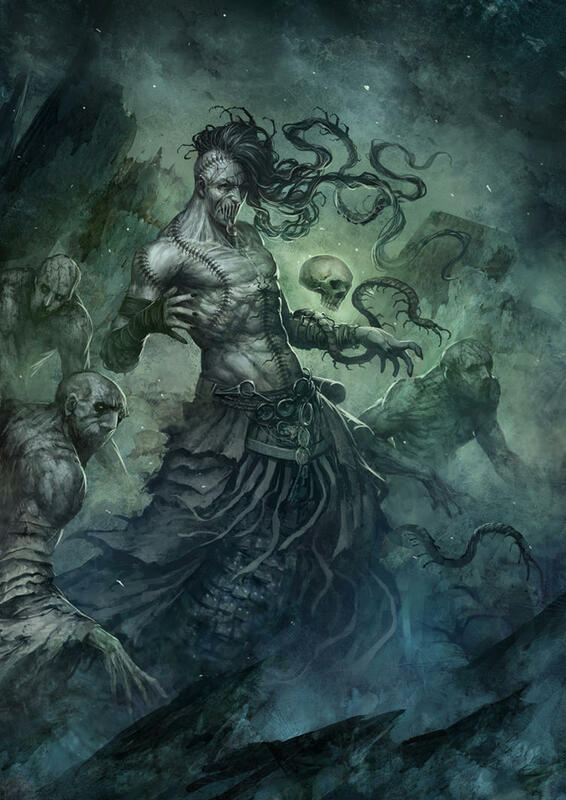 Skipping the all-or-nothing risks of self-sacrificing to an evil god, lichdom is obtained by Belmothian necromancers by turning themselves undead over the course of several years. This process ensures the maximum chances of surviving beyond the grave simply by blurring the line of where exactly the grave should be. The procedure is surprisingly well-documented. It doesn't require as much magical power as it does spare time. It doesn't demand as many Black Orbs of Glaunathaix as it does an absolute fortune of preservatives. Almost anyone with an inkling of power could start the Belmoth procedure, but most chose to not undergo it primarily because it requires you to spend several years looking incredibly ugly. Most necromancers are narcissists, and would rather avoid turning into a bloated, vaguely reptilian half-corpse, even if they can pull their stomach out and throw it in a new host body after a decade or two of torment. Because Belmothian necromancers are so passe it's rare that they form cults. Urban Belmoths usually follow the master-igor path of most mad scientists, with one devout or very well payed servant that can run errands and procure things from townspeople while the magi back at home slowly inflates. The other option, of course, is to ditch civilisation altogether. The graveyard stomach allows Belmoths a freedom to travel that necromancers usually lack, and keeping a variety of useful corpses close at hand means that Belmoths can quickly find a place in fight they weren't expecting. Adventuring parties that include a Belmoth will have to be aware of the nature of their companion. There isn't really a way to constantly hide the fact that you're a seven foot tall sphere of dead person. Something of the nature of the party can be inferred by the willingness to travel with someone that is, if not evil, at least very suspicious. This procedure is written more as a template to throw on top of a wizard/evil cleric than anything else. Make your player sacrifice all their feats, or eat up a few MP or whatever feels appropriate for balance purposes. If making an NPC you can do the same thing, obviously. Eat a cool corpse. Eat the brains of a different wizard. Eat something that should probably be inedible but smells delicious and magical, just to see what happens. Write a thesis on the effects of substance X when you replace all your bodily fluids with it. Good science involves a double-blind trial on a decent sample size, so you're going to have to kidnap a few people and see how long they last when their blood is ants. Find another Belmoth and swallow their stomach lining whole, thus absorbing their consciousness.